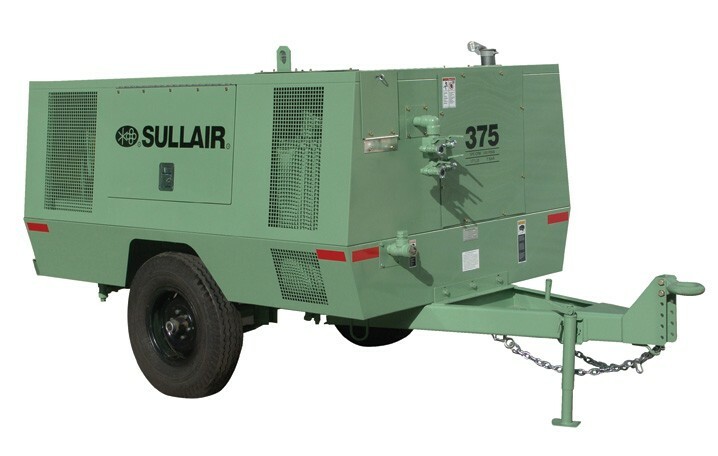 Sullair 375 Tier 3 family rotary screw portable air compressors deliver 300 to 425 cfm at 100 to 200 psig or 8.5 to 12.0 m3/min at 6.9 to 13.8 bar. Unit is designed for reliability and total accessibility featuring large side doors for easy maintenance. Powered by either a John Deere or Caterpillar Tier 3 emissions compliant engine. Mounting option is 2-wheel, single axle. Enclosure is made of durable powder coated Galvanneal sheet metal with composite end caps. Other features include independent rubber torsion suspension, wheel bearing grease fittings, and a lockable curbside instrument panel. The compressors feature a pneumatic inlet valve and 0 to 100% capacity control.